A social enterprise supporting people on the autistic spectrum and the people around them. 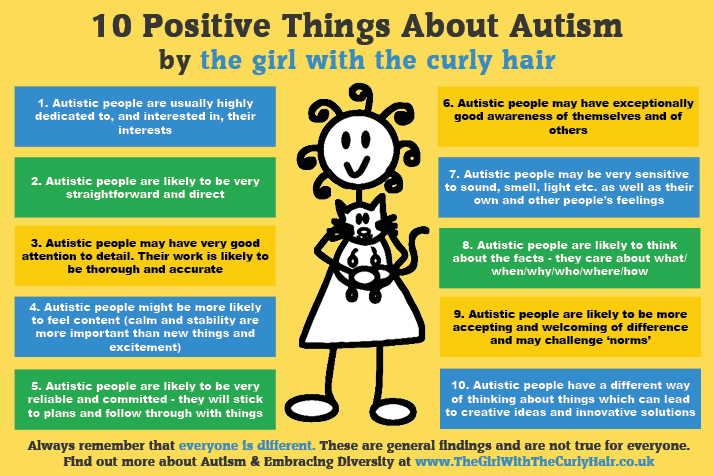 Here are 10 positive things about autistic people. Always remember that everyone is a unique individual and that these are general findings. No one will identify with all or every positive feature of autism. I suspect that although everyone can have a hobby, an autistic person may have greater interest in and dedication to their hobby than the average person is to theirs. This can give us very indepth knowledge, it means we’re very skilled at what we do, and what we produce is high quality. Communication with autistic people can be very clear, concise, direct, blunt, straightforward and to the point. This has many benefits – it means somebody else is likely to know where they stand with us, it means we do what we’re supposed to, and means we can give clear directions to other people. All of this leads to more efficient communication and means that things get done! Attention to detail is the ability to achieve thoroughness and accuracy when accomplishing a task. It is a skill that many employers find desirable. Autistic people notice details, can find patterns in things, and can spot anomalies and errors. This is quite a personal one to me. I have noticed that I need just a few things in order to feel content. My needs are common to many autistic people – solitude, routine, structure, hobbies. These things are not necessarily expensive. They are realistically achievable and maintainable. Lots of people are continually seeking new things or new experiences, with the mindset that “more/new/different is always better.” So many people are not able to achieve or maintain feelings of contentment. Another positive of autism is that we are likely to experience heightened pleasure from things, and pleasure from repetition, so it may also be easier to achieve contentment. Simple things can give a lot of pleasure. A routine, normal life can give a lot of pleasure. Autistic people are likely to be committed to the projects they choose to work on, or the people they choose to have in their lives. There is likely to be inner drive to follow through with what was expected and to get things done. The way we communicate (receptively and expressively) is very direct and clear, which means we can be relied upon to mean what we say, say what we mean, and do what we say we’re going to do. If a person has spent their whole life feeling very, very different and very isolated, it gives plenty of time to think about themselves and the workings of their own mind. One can only feel different if one is aware of other people and that other people are more similar (you can’t feel different if you are only aware of yourself as there is nothing or no one you can compare yourself to! ), so not only may autistic people have a deep awareness of themselves, they may be very aware of other people too. Heightened sensitivity is a common trait of autism. There are benefits to being sensitive – we’re very aware of our surroundings and may be the first to spot beauty, patterns (or danger!) and we are perceptive and able to pick up on things that others might miss. Sensitivity also means we’re more likely to take care of ourselves, care about the feelings of others, and have empathy or sympathy for people. I’ve hypothesised before that I suspect many autistic people are visual and/or factual learners/teachers. So many other people are driven by feelings or implied meanings, but autistic people may be highly logical and come up with discussions and solutions based on facts and what-actually-is rather than what is thought-to-be. Lots of people go about daily life following other people’s rules without ever questioning them. Autistic people are likely to question things and challenge norms. It means we’re very thoughtful and open-minded. Because we are different ourselves, it may mean we’re less likely to judge or negatively bother about other people or things that are different. People can always be themselves with me. I do not expect anyone to be a certain way, other than to be the way they naturally are. I do not expect people to fit inside a box. I appreciate and love people for their individuality and uniqueness. People like this about me. Having different or uncommon thoughts, leads to creative and innovative solutions and outcomes. Autistic people can come up with more efficient or interesting ways of doing things, and can make others question why they are doing something and what they really want out of things and life. People very often say to me things such as: “You make me think about what I really want to know/do” and “You’re right – if I want [this], then there’s no point me doing [that]” or “I hadn’t thought about it like that.” I make people think and question. Many autistic people make others think and question too. It can be a very positive gift to impart to others. Always remember that everyone is different. These are general findings and are not true for everyone who is autistic and some of the things may be true for people who are not autistic. Please pass on our article and our image to others. Why is it so important for a person with ASD to have a special interest? I have autism and l agree and identify with everything you’ve said on here. It makes for a really pleasant change to hear about the positives we have to offer rather than the burden often assumed. Well done and keep these coming! I am a Gp in Central St Leonard’s, a coastal town in East Sussex. I have a large number (& growing)_ of adults presenting with symptoms of Autism/Asperger’s Syndrome. Getting the diagnosis right is a long journey. I saw someone this morning who put me onto your website and resources. She said she has already found them very helpful. I am keen to learn all I can about adults on the Autistic Spectrum and how I can help them. I think your Project will be my Number one resource. I broadly agree with these, but I think number 4 is pretty far off the mark. A considerable majority of autistic people have anxiety and/or depression. I agree that autistic people are often satisfied with simple things, but unfortunately doesn’t seem to correlate with being content. Also, it only works if you can actually get those things. (E.g. most of the autistic people I know benefit from routine and order, but struggle to create and maintain them.) I know people are different, but with a list like this you expect it to be true of most autistic people or more likely to be true of autistic people than non-autistics, and I’m afraid that contentment just doesn’t seem to be one of those things. i have a really hard time accepting myself for who i am , so hearing the positives were really uplifting. Our website Subscribers have access to exclusive special offers. We’re often asked for recommendations of organisation and individual professionals who have some experience in ASD. Here is our small directory of the people that we know across the UK. Copyright 2018 The Curly Hair Project.